Location: On Turtle Hill (the furthest point East on the South Fork). Description: 110 feet, flashing white light every five seconds. Tower is octagonal, white and reddish-brown, made of sandstone. 1792: Construction authorized by the Second Congress. 1796, June 7: Construction began. 1796, November 5: Construction completed. 1797, Spring. Light first lit. 1860: Tower height increased to accept First Order Fresnel lens. 1903: Third-and-one-half Order bivalve lens installed. 1938: Electric and plumbing installed in keeper's quarters. 1961: Clockwork mechanism for rotating lens electrified. 1987, February 3: Automated. Optic changed to the present DCB-224. 1999: Renovations to the tower and lantern completed. Band on tower is painted a redder brown than it had been, making the color closer to the original band. Current use: Active aid to navigation/Museum. Also available for corporate, school and group tours, and weddings. 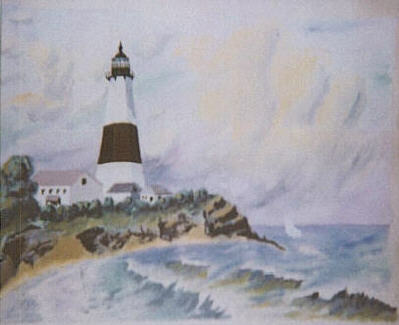 The surrounding area: Montauk Point is the easternmost point on Long Island. Bring your binoculars and spotting scope; the area is great for birding. Check the Long Island area rare bird alert before making the trip. Public access? Yes. The keeper's house and tower are open to the public. Call for museum hours. Located off of Route 27 next to Montauk Point State Park. Similar Lights: The Eaton's Neck Light is similar, but smaller, and was designed and built by the same man two years after the building of this light. permission of his daughter Laura. Check out my Montauk Lighthouse Photo Gallery. See some pictures from my visit to the Montauk Lighthouse Museum. See a Montauk Point Sunrise.